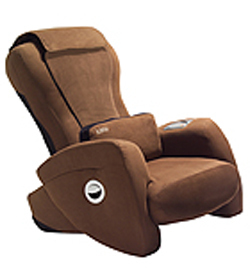 The New Larger, More Luxurious iJOY 130 - an upgrade from the iJOY 100. iJOY Massage Chair Recliner with Human Touch Technology - two times lLarger than the iJOY-100 and the very least is Longer, Wider, and Taller, plus it comes with a Built In Remote Control. Assembly required. iJoy™130 does what you tell it. Each of four powerful massage modes can be programmed to give you the touch you prefer. The controller has three different programmed massage sessions of 15 minutes, which means you can kick back and enjoy a programmed massage whenever you feel like it. Perfect for the game room, college dorm room, apartment, loft, or recreation room, iJoy makes the perfect gift for grads and dads. Add an Ottoman 2.0 for the ultimate full body experience. The multi-patent Human Touch Technology massage system so closely replicates the therapeutic techniques used by back and spinal care professionals that it is the preferred technology of the American College of Chiropractic Orthopedists. It is designed to follow the natural contour of your spine and move three-dimensionally in four different modes.